No tornadoes for me today. I did much the same as a number of other chasers, going after other storms to the SW of the more northeastern and earliest storm that produced an F2 tornado near Hiawatha in far northeast Kansas. Two things kept me from a chance to see this tornado. First, I fooled around in the Topeka area too long trying to find a wireless internet connection, rather than waiting patiently in my target area just north of there and watching the sky. Second, I picked the logical, but incorrect storm. I debated going right to go after what turned out to be the tornadic storm as I headed up 75 from TOP, but elected to go left instead thinking that the cells further west and south would be in better instability/inflow/helicity. That decision was good in theory, but Ma Nature does what she wants, and this time it did not fit the theory. But I am getting ahead of myself. My morning analysis of model output showed that, while all storm parameters looked good througout eastern Kansas (and nearby areas as well), the models seemed to indicate more isolated, intense precipitation in the area north of TOP, and this area would also have better forcing and less cap. Turned out it had too much forcing and not enough cap, but I was not thinking that way when I started out. I also did not want to get into chasing NW MO, which is lousy chase country (though it turns out NE KS is not a lot better.) Anyway, for the above reasons, I decided tentatively that my target would be northeast Kansas, probably starting out a little north of TOP. This area, as it turns out, did produce the best tornado of the day, but it was early, quick, and not easy find from among the several storms that popped up almost simultaneously. I left Wichita around 10 for a leisurely drive up to Emporia, where I would check data at the Flying J. Got there around 11:20 after a couple brief stops along the way, and chatted with chaser William Blumenthal, who was gassing up his impressive chase vehicle right next to where I was filling my own less impressive vehicle. I then went inside, got a wireless internet connection and lunch, and looked at data and chaser chat for about an hour and a half. Though a lot of folks were thinking about targeting farther south in OK, in part to avoid the expected massive chaser convergence in the high risk area in NE KS, I saw no reason to change my target, nor did I have any desire to drive back where I had just come from the night before. So I kept my target just north of TOP, and headed out for that area around 1:30. At this point came a highlight (lowlight?) of the day - as I got back on the Kansas turnpike at Emporia, coming through the toll booth the other way, getting off, was the "Tornado Attack Vehicle" or whatever they call that thing. I can't imagine what the toll booth attendant thought when that thing came through! Of course I had a line of cars behind me so could not dig out the camera for a pic! I was into the TOP area by around 2 or so and initially drove to my target area around 15 mi north of town. Sky was largely obscured by lots of moderate CU all over the place; could not too much tell what was going on so felt the need for more data. Figured I could find a wireless internet connection somewhere in the north fringes of TOP, so headed back but did not find one. Finally around 3 I saw anvil tops to the north poking through the mess of cumulus, so headed up 75 as fast as I could. By the time I was back 15 or 20 mi north of TOP, it was obvious there were storms both to my NE and to my W and NW. The one to the NE looked pretty good, but so did the ones to the west, with very hard crisp towers. There were obviously a number of cells popping along the line, not just one or two isolated ones. Based on the logic above, the fact that the tail-end storm is often considered a better producer, and the fact that the northeastern storm would soon be crossing the MO river, I decided to target the storms to my W or WNW. I cut west off 75 on 16, then realized I needed to get north and headed up through Soldier to about 4 miles SSW of Goff. 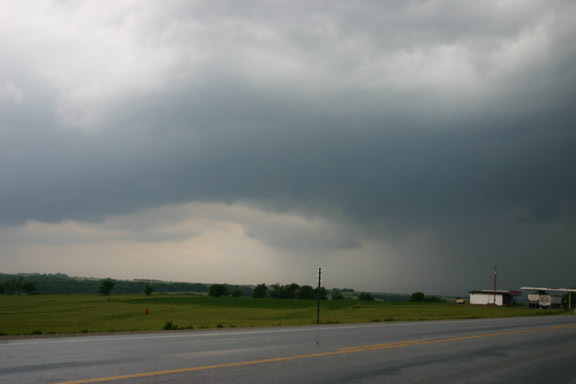 I stopped a few times to view and video the storm, which was looking supercellular and was SVR warned. I saw some small lowerings at the location SSW of Goff; there I met up with a tour group whose leader kindly let me look at the group's live radar, and warned me about the "larger than golfball" that turned his group around a few miles north. (Sorry, I did not get which tour group it was.) This really was the first chaser convergence I encountered, and one of only two that involved at least 3 vehicles - I think the numerous storms all over the place kind of scattered the chasers so the feared massive convergence did not occur.) He also mentioned that the cell off to the NE was tornado-warned, and I had heard a SVR warning also for the next storm down the line to the SW. But I could not get to the NE storm now (in fact it was about this time that it produced the tornado) and the storm I was on looked too good to abandon for the next one southwest, which I figured I could always easly get back to anyway, given the northeastward movement. So, I waited until I was confident the storm had passed Goff, then headed through Goff and back to 75 for the intercept near Sabetha. When I got to that area, the storm was looking better again, after it had seemed to temporarily weaken after moving NE of Goff. 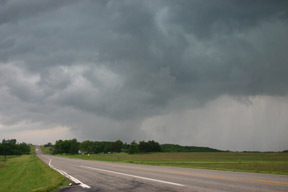 An RFD began to wrap around the meso, and then, as the storm went TOR warned, a lowering formed south or SW of Sabetha. About then I realized it was moving toward the only place I could to to keep up with it, so I blasted back up to the intersection of 75 and 36 from where I had been watching a mile or so south of there, went east a little, and redeployed just east of Fairview. From that location, I saw a large wall cloud to my WNW between the interseciton of 75 and 36 and the town of Sabetha, or perhaps about over Sabetha, and really thought for a minute that storm might do it - until rain and hail quickly surrounded the wall cloud and killed the inflow (something that seemed to happen a lot today). As the precipitation killed the inflow, I turned back to the west toward Fairview, and there encountered the second chaser convergence. Talked briefly to a chaser to said his group saw a brief tornado to the east about 15 or 20 minutes earlier, but have seen no confirmation on that. I decided to head back south and/or west to see if any other good storms might be coming up the line, but was getting less optimistic, as the storms seemed to be getting more linear and less supercellular. 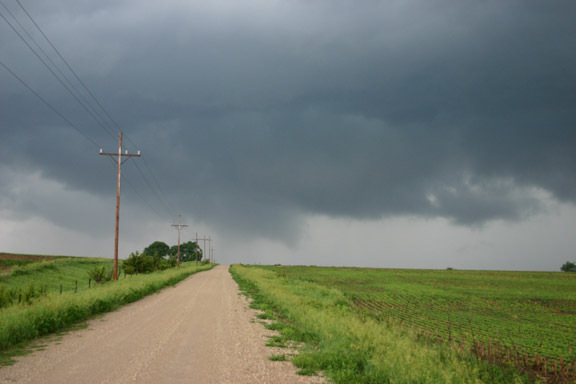 Later, heading back south toward TOP, I thought I could get ahead of a severe storm coming out of Pottawattomie Co. However, the violent outflow caused the storm to surge forward, and confronted with a nasty looking shelf cloud and a suspicious blue color in the clouds, I turned around, avoiding the 60+ mph wind and 1+ inch hail in this storm. Eventually, this cell produced a tornado just east of the Pottawattomie Reservation, but of course I was completely on the wrong side of the storm to see it. Returning to TOP after the storm passed, I watched the hail shafts on the next storm as 1-inch hail fell on north Topeka, and caught, in the distance, what looked like a nice wall cloud at sunset on a SVR warned storm west of TOP. This storm did cause some wind damage when it moved through the Topeka area a little before 9. I spent the night in the KC area, where I watched some intense wind-driven rain and some nice CGs shortly after my arrival. I headed home the next morning for what I hoped would be a possible backyard chase in IL, but it did not materialize. This was an OK day, and I probably would have been satisfied had the expectations not been so high and had I not missed the one spectacular tornado of the day by going after the wrong storm. Though I did see several severe storms, it was a disappointment today compared to the promise it seemed to hold and compared to what I might have seen with slightly different decisions. Such is 2005, I guess. Congrats to all who caught the Hiawatha tornado - some very impressive pics! Local storm reports fron NWS Topeka.